There's aren't many ways to get off an island. In milleniums gone past, we might have done it the manly way by usig a raft. Risks included such activities as going for a prolonged swim, partaking in a fish supper or discover Skull Island. The island of Crete is a nice enough place and it doesn't really induce that kind of desperation to get out. Today, I'm taking a journey of a less risky kind. I'm flying into Bucharest, going from a EU country into a non-EU country. First I booked my flight tickets, then I checked if I was allowed in without a visa. Yeah, I forgot to check first. But it's alright, Romania is part of the Schenegn and I'm ok. I don't land in Bucharest till 1930. The passport control in Romania has got to be the most lax anywhere in Europe so far. The security dude took one look at front of the passport and waved me through. There's buses, but no trains from the airport into the city proper. The train option is a mini van ride to a small train stop two km away, followed by a 30 minutes train to Gara de Nord, one of the main bus stations in Bucharest. Depending on how things go, I'd decide on arrival whether to carry on to Brasov or stay overnight in Bucharest. As it turned out, I don't get to Gara de Nord till 10.30 and there's no train to Brasov anyway. As a backup plan, I knew that there were quite a few decent hotels around the station that had rooms. The area around Gara de Nord is not the nicest. Something like the train stations of India, with plenty homeless living around the station. The walk to the hotel was just as depressing, the homeless and begger lining the streets all the way. In the morning, I head to Brasov and 2 days later, I'm back in Bucharest, with 2 days to see what's in the city. Actually, it's more like 2 half days, plus one full day. 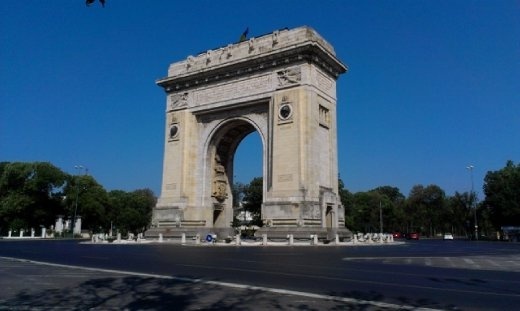 There's actually very little to day about Bucharest. I can't believe anyone can describe the city as "Paris of Eastern Europe". Admittedly, I haven't been for a long time, so it's entirely possible that Paris is now devoid of culture, but I don't think so. It's said that Nicolae Ceaucescu once visit North Korea. Inspired by what he saw, set about transforming the architecture of the city to be something "practical". Bucharest is ugly. It's not the ugliest city in the world nor the dirtiest, but it's right up there with the "best". The city is just full of concrete high rise flats, one after another. Want to learn about Romanian history? There's plenty of museums, assuming you like to learn about the Romanian peasantry. In fact, the relic of Romanian communism seems to be an obsession with Peasants. There's the open air museum of Museum of Peasant's Village, the Museum of Romanian Peasants. By midday, I can't bear the heat any longer and just head to the hotel for a little bit of air con heaven till it's time for the train. Overall, even two days was too much in Bucharest. This capital is no shining example to the rest of the country, but a conglomeration of old building left over from the communist period. Left to rot by inhabitants who feel no nostalgia for it's communist past. It probably would have been better to do one day in Bucharest and spend as much time as possible in Transylvania. Maybe even stopping off on every town of interest between here and Brasov.